"Case Studies : Delay in Marriage"
(2) Venus and Jupiter are significators of marriage for males and females respectively. Marriage can also take place in the sub-periods of the strong planets placed in the houses signifying marriage. These planets become secondary significators of marriage. (2) Significator of marriage being weak or badly placed and/or afflicted by the most malefic or a functional malefic planet. (3) When the prime determinants and secondary significators are weak and/or are afflicted. (4) When the lords of the eighth and/or twelfth houses containing a mooltrikona sign are weak, badly placed and are afflicted. The influence of the functional malefic planets delays while the influence of the most malefic planet (MMP) delays inordinately and/or denies. The malefic influence of the MMP cannot be mellowed without persistent performance of the appropriate astral remedies. If there is a mooltrikona sign in the eighth house from the ascendant, its lord is called MMP. In case there is no mooltrikona sign in the eighth house, then the role of the MMP is played by the lord of the twelfth house containing the mooltrikona sign. In case there is no mooltrikona sign in the twelfth house, as well, then the role of the MMP is played by Ketu. The sign Leo rises in the ascendant. The planet Saturn is the prime determinant of marriage for Leos. Saturn is weak in the chart due to infancy and bad placement. Mercury is weak due to its being in the state of combustion. The Moon is weak due to bad placement. The MMP closely afflicts the badly placed significator for husband, Jupiter. The MEP of the seventh house is closely aspected and afflicted by the functional malefic, Ketu. The lord of the second house, Mercury, is also closely aspected and afflicted by the functional malefic, Rahu. The weaknesses and afflictions in the chart were delaying the finalization of marriage when the help of astrology was sought. The propitiatory astral remedies for the planets Rahu, Ketu and the Moon were suggested besides wearing a KAVACH containing the mystical numbers of the planets the Sun, Mercury, Jupiter, Venus, Saturn and Mars. The performance of astral remedies helped in solemnization of the marriage in early 1995 during the sub-period of Mercury in the main period of Rahu which was in progress since 9th June, 1992. But for the remedies, the weak Saturn and afflicted Mercury may not have blessed the native with the marriage. The sign Cancer rises in the ascendant. The Sun becomes the prime determinant of marriage in this chart. The Sun is in the second house and lacks power to some extent. The lord of the fourth house, Venus, is badly placed and has become weak. Venus is closely afflicted by the aspect of the MMP, Saturn. The lord of the house of marital ties, Saturn, is almost dead and weak as it is in the thirtieth degree. This weak Saturn is also afflicted due to the severe affliction of functional malefic, Jupiter. In this case, the lord of the fourth house is under the severe affliction of the MMP and hence it caused a lot of delay in the marriage. The propitiatory astral remedies suggested for Saturn, Jupiter, Rahu and Ketu helped in marriage during the sub-period of Saturn in the main period of the Moon. Later on, for prosperity and good health, the native also took advantage of the KAVACH for the functional benefic planets, the Moon, the Sun, Venus, Mercury and Mars. The sign, Leo, rises in the ascendant. Saturn is badly placed and combust. Mercury is placed in the mooltrikona sign of Saturn and has become weak. The Moon is MMP and its close aspect on the MEP of the fourth house is undesirable for the purpose of marriage. The MEP of the seventh house is closely afflicted by the aspect of Ketu besides the seventh lord being combust and badly placed. The significator of marriage, Jupiter, is also weak due to infancy and bad placement. The weakness of Jupiter also robs the person of discipline in life, which is required for strict performance of the astral remedies to ward off the affliction of the MMP. The native's mother sought astrological help in the year 1995. The astral remedies were prescribed but the native never performed them with sincerity and regularity. The result is that she is still unmarried. The sign Aries rises in the ascendant. Venus is the prime determinant as well as the significator for wife. Venus is closely afflicted by functional malefic, Mercury. The MEPs of the second, fourth, eighth and twelfth houses are under the close affliction of Rahu-Ketu. Jupiter placed in the second house is also under the close affliction of Rahu-Ketu. Due to severe afflictions, the marriage of the native was inordinately delayed in spite of being a professionally settled medico. The native asked for astral help in March 1995, when he was under the sub-period of Jupiter in the main period of Saturn. The application of propitiatory remedies for Mercury, Rahu and Ketu and use of KAVACH for functional benefic planets, helped the native and his marriage was solemnized in the end of the year 1995. The prime determinant for marriage, Jupiter, is in infancy, badly placed, and under the severe affliction of MMP, Ketu. The significator for wife is in its sign of debilitation and has become weak. The marriage of the native was inordinately delayed. The native married in 48th year. The marriage was not a happy affair from the very beginning. Astral remedies were prescribed for the harmonious continuance of marriage. Mars becomes the prime determinant for marriage. 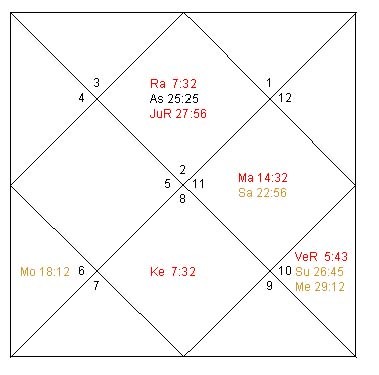 Mars is badly placed and afflicted by the close conjunction of Rahu. The significator for wife, Venus, is badly placed in the state of debilitation. The MMP afflicts the MEP of the seventh house. The secondary significators Saturn and Jupiter, too, become weak due to the weakness of dispositor, Mars. The native at the age of 56 years is still unmarried and has now abandoned the idea of marrying. The sign Taurus rises in the ascendant. The Sun becomes the prime determinant of marriage. The Sun lacks power as it is in the first degree. The MMP, Jupiter, is afflicting the MEP of the second and eighth houses. The weakness of the Sun and the affliction of the MMP has denied marriage so far. Though Jupiter in this chart becomes the secondary significator of marriage, its role as MMP takes precedence over the former role. As Jupiter is MMP, the native is not regular in the sincere performance of astral remedies and hence the delay in marriage continues. From July, 1995, the sub-period of Venus in the main period of Rahu is in progress. Taurus rises in the ascendant. The prime determinant, the Sun, is weak due to its being (i) in the sign of debilitation, (ii) in the state of infancy, and (iii) placed in a malefic house. The significator for marriage, Venus, is in its sign of debilitation. The MMP afflicts the MEP of the second and eighth houses. The MEP of the seventh house is severely afflicted by the close aspect of functional malefic, Ketu. The marriage was inordinately delayed. The native was married in the year 1990. The native sought astral remedies for progeny in the year 1995 as he was not blessed with a child up to 1995. The MEPs of the fifth and second houses are afflicted and the significator for progeny is weak due to its being in the state of infancy. The prime determinant of marriage is in close conjunction with Ketu. The lord of the house of family is in the thirtieth degree and hence very weak. The significator for husband, Jupiter, is under the close aspect of the MMP and afflicted. Due to these planetary influences, the efforts of the parents for finalizing marriage of this girl were not successful. Astrological help was sought in the year 1990 when the native was running the sub-period of the Moon in the main period of Mercury. The native was not prepared for performance of the astral remedies which is quite clear from the affliction of Jupiter by MMP, Venus. The native thought that she belongs to a well-established and respectable family, is well educated, and beautiful and the marriage will take place within the next four to six months. Seeing the weakness of the next sub-period lord, Mars, and the following sub-period of severely afflicting Rahu, it was indicated that the marriage may not take place for the next 2 or 3 years if the astral remedies were not performed. The girl was adamant. As luck would have it, the marriage could not be finalized for the next two years. Again the parents asked for astrological help and confirmed that the girl was ready to perform the astral remedies as prescribed. With the help of the astral remedies, the marriage took place in December 1992. The sign Taurus rises in the ascendant. The prime determinant planet, the Sun, is placed in the ninth house and is closely aspected and afflicted by the MMP. Jupiter is MMP for the people born in Taurus ascendant. Jupiter also afflicts the MEP of the seventh house. The delay in marriage was indicated. In such cases, marriage cannot be finalized without the performance of appropriate astral remedies. The position of Jupiter as a significator is weak as it is in the 28th degree. As luck would have it, the native was not ready to perform the astral remedies. The marriage could not be finalized even in a period of more than two years in spite of the persistent efforts of the parents. The native agreed to perform the astral remedies only in August 1991 when it was indicated that the marriage may be finalized before March 1992. The marriage of the native took place in January, 1992.